Pray together. Even if it's just an Our Father or Hail Mary, it unites the family. Let each family member mention one person or problem that they would like to pray for in a special way at dinnertime. Take the kids grocery shopping for the poor. Let them help you bring the food to your parish pantry or the local food bank. Let children light a candle at church for people throughout the world who are sick or hungry. Sample Lenten food favorites,such as hot cross buns or pretzels. If you're really adventurous,check the Internet for recipes and make your own! Check your diocesan newspaper for the location of a Passion play. Take family members and friends. Pretzels originated in Europe during the Middle Ages. A monk was making unleavened bread for Lent with flour and water because eggs, milk and lard were not consumed as part of the Lenten fast. He twisted some of the dough into the shape of people praying with both arms folded across their chests. He decided it would be a perfect treat for children learning to say their prayers. He called the treats pretiola, the Latin word for "little reward." Above ideas were taken from the Our Sunday Visitor website HERE. Ideas below were taken from the Catholic Icing website HERE. 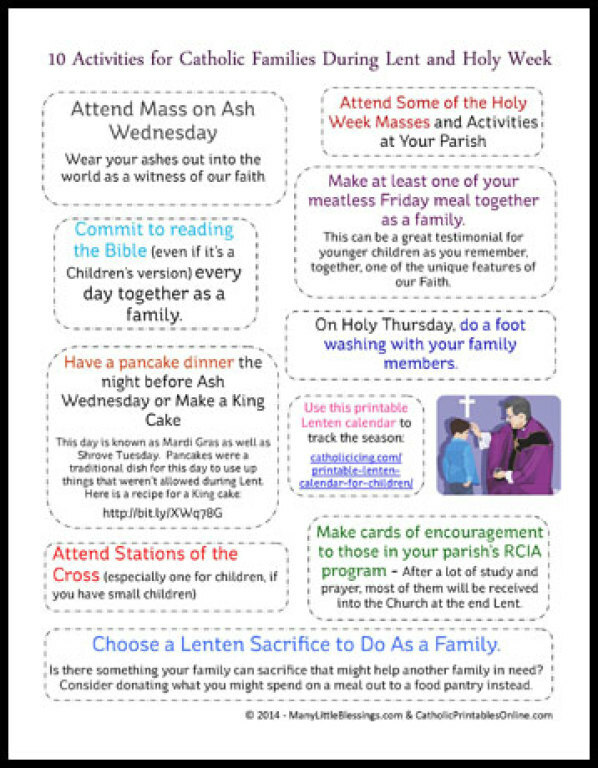 Go to Mass as a family on Ash Wednesday. This is so great because even the smallest members of the family can have ashes. Read the scripture about when Jesus goes into the desert. Motivate your children to do good deeds and make sacrifices. We often do the crown of thorns, but a sacrifice jar with beans is easier to set up. Sacrifice beads also work well. Give something up for Lent as a family, even if you kids are young enough that you don’t “have” to. We always give up candy as a blanket sacrifice, and then decide on other things. Other good “blanket sacrifices” are no music in the car, no eating out, silent “monastery” lunches, or drinking only water during Lent. Set up an almsgiving box– you simply set out a box, and take 1 thing from your own pantry every day of Lent. At the end of Lent, take the box to a food pantry. Set up an offering jar– all you need is a jar or piggy bank of some kind. Spare change goes into the jar for the length of Lent, and then is donated. Add extra prayers to your daily life. Maybe this is extra prayers in the morning or at bedtime. If you have older kids, encourage them to set extra goals for personal prayer as well. Pray the sorrowful mysteries of the rosary together- daily, weekly, whatever works for you. If this feels overwhelming with little kids, try just 1 decade. Pray the Divine Mercy Chaplet together- this is also a faster option than a rosary for those with littles. Make pretzels together. If you don’t have time to do this from scratch, get the Pillsbury bread sticks in a can and make them that way. Go to daily Mass. You decide how often this might be doable at this current stage of your life. Go to adoration. Even if you can’t stay long with little kids, it’s still worth going. 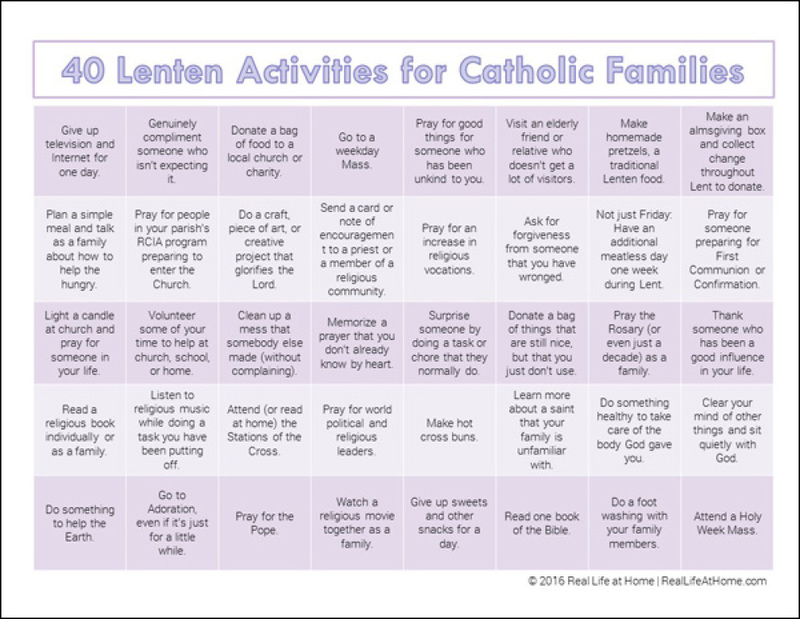 Count down the days of Lent with a printable Lenten calendar for your kids– a lot easier than making paper chains! Bury the Alleluia- this can also be very easy. I offer a printable way to do this here. Attend stations of the cross at your church. We especially love to do this on Good Friday. Cook simple meatless meals together with your kids. This will be a good sacrifice opportunity for you. Listen to the stations of the cross on CD. We love listening to ours at home, and this is a great for car trips, especially if you’re traveling to see family on Easter. Sing “The Lent Song” with your kids. Wash your children’s feet on Holy Thursday. Encourage better attention during Mass by assigning each member of the family 1 reading to pay special attention to (first reading, Psalm, second reading, and the Gospel). Have everyone give a re-cap of “their” reading on the way home in the car. Have a family discussion if anyone had thoughts about the readings. On Good Friday, have an hour of silence at your house from 3-4 (because Jesus died at 3). Allow your kids to read spiritual books during this hour of silence. 40 bags, 40 days. You pick the size of the bag (Paper bag, Wal-Mart bag, trash bag, lunch sac) and you get rid of 1 bag full from your house every day. Donate what you get rid of. This is an excellent exercise in living simply. Lenten cleaning- rather than the idea of “Spring cleaning”, clean 1 area of your home every day during Lent. Your house is beautiful and clean for Easter! Sing a Lenten hymn together each day as a family. We like to do this in the morning. You can sing the same hymn each morning until everyone has learned the words, then move onto another one. Attend extra activities happening at your parish, such as Friday fish fries. Do some of the works of mercy together with your kids. Watch a Lenten movie together as a family- I like The Greatest Adventure Easter Story for little kids. Read the Bible together as a family daily. This can be done in the morning at breakfast, and doesn’t have to take long. You can just read a paragraph each day. Decide 1 day of the week during Lent to go “screen free” as a family. Light a candle at church on Sunday. “Un-decorate” your mantle to keep things simple for Lent. Put a purple table cloth out on the table. Explain liturgical colors to your kids. During Holy Week, read the story of Palm Sunday, the Last Supper, and the crucifixion from the Bible. Memorize a new prayer together as a family. Join Holy Heroes Lent adventure– easiest. thing. for mom. ever. Basically, make sure you’re including more prayer, fasting, and almsgiving than during ordinary time. And the number 1 easy thing that takes no extra effort that I really want you to do is…. Save all of the Easter celebrating for Easter!